Looking to make a positive change in your life? Maybe you've read a few self-help books and think you know what you need to do -- maybe some positive thinking, making a resolution or simply wishing for happiness? Well, here's some news: none of this is going to help; you simply don't get things in life just by wishing for them. 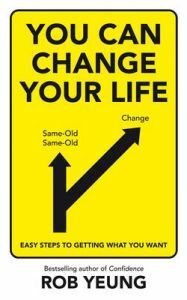 In You Can Change Your Life top psychologist Rob Yeung investigates ways of making change stick. He offers the most up-to-date thinking on the skills, beliefs and methods that will help you to change your life. Rooted in evidence-based research and based on proven strategies and treatments, Rob offers a new perspective and new techniques to enable you to transform your life, or simply work out what's stopping you from achieving your goals. You can lose weight, feel more positive, give up a bad habit, get ahead at work or improve anything about yourself. Whatever you want to achieve, you will feel inspired by the practical advice in this fascination book and be able to tackle change with confidence. Psychologist Rob Yeung, PhD, is a researcher and educator in the areas of human communication, influence and persuasion, and high achievement. He is the author of over a dozen international bestsellers, including Confidence: the power to take control and live the life you want and I is for Influence: The new science of persuasion. As well as teaching at universities and business schools, he is an in-demand expert on television, providing expert comment on programmes ranging from CNN and BBC news to Big Brother. He has written for the Financial Times, the Daily Telegraph and the Guardian and has been quoted in publications ranging from Men's Health and Psychologies to the Wall Street Journal.